On Monday morning Erick, Emily, Molly and I had the rare opportunity to visit an active archeological dig. We accompanied Neal Orsini, our guide and owner of the Anvil Inn (and also the 30,00th visitor on board the Lois in 2007), to the Sutler’s House site adjacent to old Fort Edward. 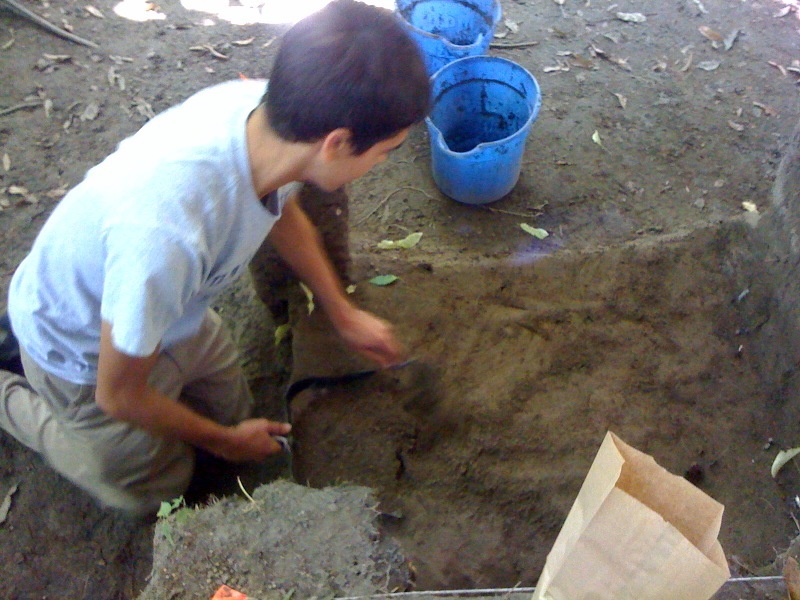 An archeologist excavates the Fort Edward site. production of projectile points) as they worked. Perhaps the biggest find was by Molly, who found a curious lead object outside a groundhog hole. Site archeologist David Starbuck suggested that it would take hours of research to determine what it could be. Following our brief tour of the dig we went to the Rodgers Island Visitors Center where we were able to see their fine exhibits and visit the conservation lab. In the lab we viewed many objects recovered from the dig. This special opportunity to get a first hand look at the 18th century history of Ft. Edward made our stop here very memorable. Jeff is a history teacher at Champlain Valley Union High School during the school season. He has worked as a captain for the Lake Champlain Transportation Company, as well as volunteered for many years at LCMM. He joins the crew of the Lois this year as second mate.